As the closing event of the kick-off meeting, the first DETECt public workshop took place in Bologna on April 26. Colleagues and students from the University of Bologna were able to hear about some of the work that led to the launch of project and to learn about other research initiatives carried out by DETECt partners. Jacques Migozzi (University of Limoges) offered a broad overview of the collaborative research completed in the past ten years by numerous DETECt partners in the frame the EPOP project and the activities promoted by the LPCM association. EPOP: Popular Roots of Europe through Film, Comics and Serialised Literature (1850-1930) was a research and dissemination initiative funded by the European Commission’s Culture Programme between 2008-2010. EPOP first established the international network that later developed into the DETECt consortium. The project focused on the rise of modern popular culture in the Old Continent in the late nineteenth century, showing how – even during this early period – stories, characters and images ceaselessly migrated from a medium to another, as well as from a country to another. The online museum was one of the main outputs of the project. LPCM (Litterature Populaire and Culture Médiatique) is an international research association affiliating more than a hundred scholars working the fields such as Literary, Film and Media Studies, Communication, Cultural Studies, etc. From its launch in 2011, LPCM has promoted a number of research and networking initiatives, including workshops, conferences, publications and collaborative research projects. This work has encouraged the members of the network to further develop their interest in the transnational circulation of popular culture, supporting experimentation with new approaches such as distant readings and Digital Humanities. More information about the activities of the association can be found on its website. Kim Toft Hansen (Aalborg University), Anne Marit Waade and Pia Majbritt Jensen (Aarhus University) discussed the methodological concerns and research findings of their important project What Makes Danish TV Drama Series Travel, which was funded by the Independent Danish Research Fund between 2014 and 2018. This initiative investigated the causes of the global success of contemporary Danish television, exploring this phenomenon from the points of view of production, reception and representation. 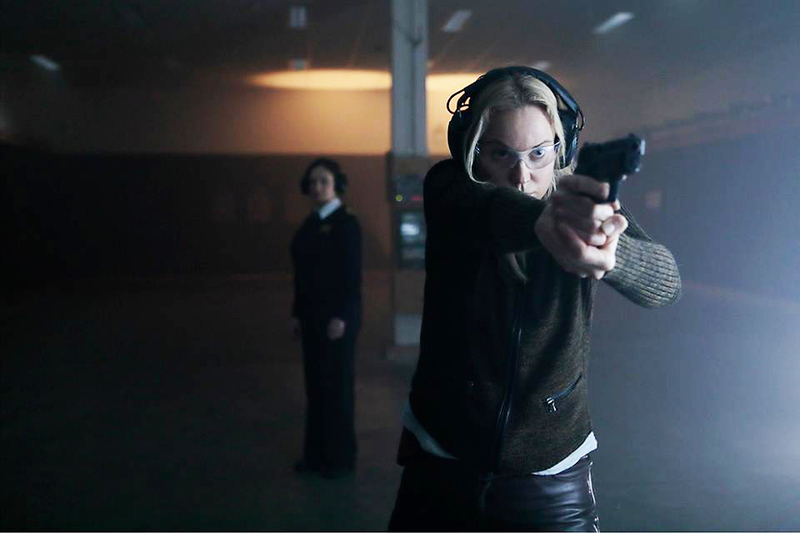 While not focused on the crime genre, the project paid particular attention to the role of this specific time of shows, also because of the importance of Nordic Noir in this context. Series such as Frobrydelsen (2007-2012), Broen/Bron (2011-2018) and Dicte (2012-2016) have indeed significantly contributed to the success of Danish television. Even more importantly, the research questions and methodology addressed in this project offered valuable suggestions to the DETECt partners for their own work. Maurizio Ascari (University of Bologna) discussed the relevant case studies of expatriate authors writing crime novels about their adoptive countries. Ascari examined the novels of British writers such as as Magdalen Nabb, Michael Dibdin and Donna Leon, who have all lived and set their detective series in Italian cities. Their different approaches to the linguistic and cultural features of Italy are at the core of their work. These features are both reflected and transformed in the audio-visual adaptions of the novels, which can further complicate the transcultural elements of this phenomenon, as is the case with in the curious German TV series Donna Leon (2000-2018). Caius Dobrescu (Bucharest University) addressed the topic of the (criminal) network in contemporary popular culture, focusing in particular on the case of the representation of (criminal) family structures in Eastern TV dramas. Dobrescu emphasised how the concept and the image of the network has gained a central place in contemporary society, from globalisation theory to Internet studies, from data visualisation to social media analysis. In the field of crime narratives, this topos has been explored in multiple ways, including the focus on the transnational links established by criminal organisations, and the key role played by the idea of the family. These topics are at the core of a set of TV series recently produced by HBO Europe in Romania, Poland and the Czech Republic. Umbre (2014-), Wataha (2014-), Valea Muta (2016-), and Pustina (2016-) represent transnational and transcultural networks cutting across political and social borders. In fact, these shows are possibly only the first examples of a new wave of crime shows from Eastern Europe to be produced with the explicit of objective of being exported on a global scale. The first DETECt public workshop took place in Bologna on April 26. Speeches by Jacques Migozzi, Kim Toft Hansen, Anne Marit Waade, Pia Majbritt Jensen, Maurizio Ascari, Caius Dobrescu.